Posted October 5th, 2017 by Jeremy Dalton. Service South can help you with home automation in Atlanta, Fayetteville, Griffin GA, Marietta, McDonough or Newnan GA. Home automation goes way beyond a timer on your pool pump or sprinklers set on schedule. Modern day home automation is the integration of various electrical and digital systems into one main control. This main control enables you to fully automate your home with an easy to use interface. This interface can be in the in form of a smart phone app or some wall mounted panel. This provides you the ability to control your environment with the touch of a button. Home automation gives you control over the electronic components in your home, from within or remotely. A basic system can for example switch on your lights, security alarms, set the room temperature, play your favorite music and so on. Advanced systems can be built to your requirements. Proper home automation requires internet connection. That is why is sometimes referred to as the “Internet of things”. These things could include security features, HVAC systems, lights, window shades, pet feeders, surround sound systems and more. These devices can accept electronic or digital commands there by providing occupants with ability control these items. Home automation improves security, saves time, saves energy, makes life more convenient and improves the overall quality of life. The best way to understand home automation is to visualise how it can improve your life. For example, when you come home from work your drive way lights fire up, your security system disarms, you garage door opens, your HVAC starts up, your music starts playing and so on. Home Automation in Atlanta, Griffin, Marietta, and surrounding areas, including McDonough & Newman. 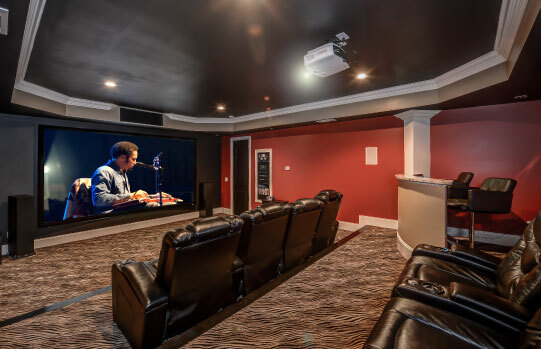 Offering Home Theater, Home Audio Installation, and more.